Bob and Mike Bryan lifted a record-equalling 12th Grand Slam men's doubles title with victory over Leander Paes and Radek Stepanek at the US Open. The second-seeded American brothers won 6-3 6-4 to go level with Australia's John Newcombe and Tony Roche as the most successful duo of all time. It is a record for the Open Era, moving the Bryans one major win clear of Todd Woodbridge and Mark Woodforde. Paes and Stepanek had beaten them in January's Australian Open final. 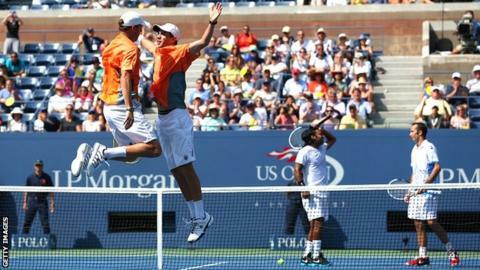 But the Indian-Czech pair could do nothing to stop the Bryans on home soil as the twins claimed a fourth US Open title. They have also won five Australian Opens, two Wimbledons, one French Open and an Olympic gold medal as a team. "It's unbelievable," said Mike Bryan. "It's not going to sink in for a long time. We're just having fun. "We had to play our best tennis against these guys. They're legends. You can't beat these guys every day but we played great." Stepanek commented: "They started well and were all over our serve. They really deserved to win, they were the better team today." Paes added: "Today we got beaten by one of the greatest doubles teams of all time."